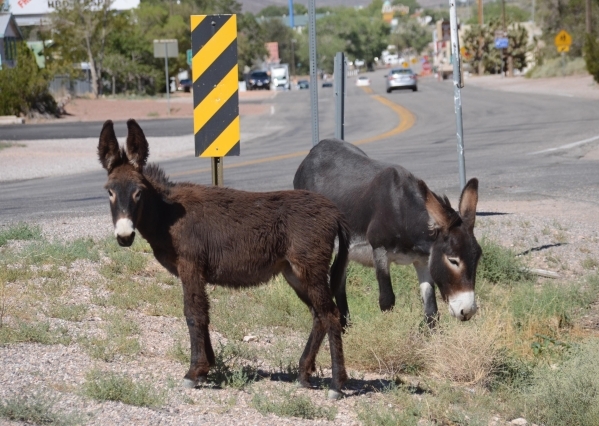 BEATTY – Wild burros – Beatty residents either love them or hate them, with few in between the two camps. Those who love them have even given some of them names, like Becca and her two offspring, Echo and Jackpot. Some locals and many tourists feed them, so they have taken to approaching vehicles looking for a handout. Last year some of them actually ran into a vehicle that was slowing to turn into the Motel 6, causing substantial damage and leaving one of them with a pronounced limp. They were once again a topic at the Beatty Town Advisory Board meeting July 27, as Tim Coward, from the Bureau of Land Management’s Battle Mountain office, gave a presentation on a planned burro gather in Beatty. Using a trap, the agency plans to gather and remove 40 burros from the Beatty area, and Coward said that they already have adoption requests for that number. Some of them will be trained to perform useful tasks, such as pulling carts, and will go to owners in other countries. Coward says that adoption is much less expensive for taxpayers. The cost of gathering them is about $1,000 apiece. If they are then kept in a holding facility for the rest of their lives, the cost is about $50,000 apiece. He said that with the drought, springs have been drying up, and there is less water and forage for the animals. Most of the people at the meeting were more interested in seeing burros in the area outside of town gathered. Coward said he was aware of the large number of burros in the area just north of Beatty. He said that just driving down the highway, he had counted roughly 160, mostly on the east side of U.S. Highway 95. Anne Marchand said that she and her husband had counted 50 near the Saga (Sterling) mine before they just quit counting. Coward said he would like to gather more burros, but that there is quite a process the agency has to go through to satisfy regulations and get a gather approved. He said they would be pursuing it. Linda Shirley, who could not attend the meeting, sent a letter in support of the burros. Shirley said people would come in daily to the Chamber of Commerce when she worked there and ask where can see them. 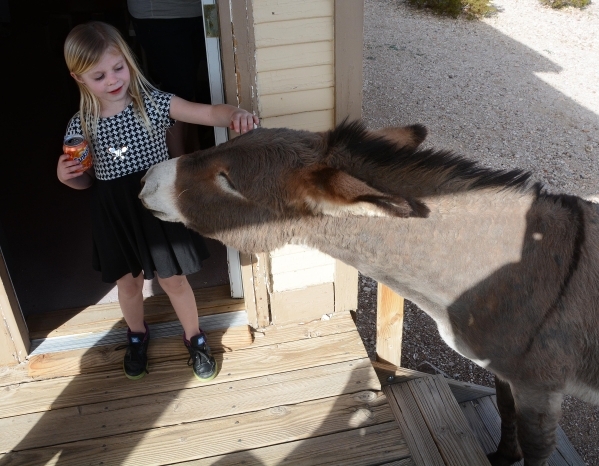 “Whenever they are on Main Street, almost every vehicle will stop to take pictures of the burros, and many get out to stand with them for a photo or even pet them,” she said. “This is one of the many attractions we have in Beatty, and I would hate to see anything happen where they would no longer be here. Shirley said that most of the burros are outside of town and are not used to people, so they stay away. Coward says he expects to do the gather in mid-August. The last time the BLM gathered burros in the Beatty area in 2012 they spared the in-town ones.